28 Reviews for Guidry Custom Homes, Inc. Relationship: I am a professional that works for this comany and have hired them. 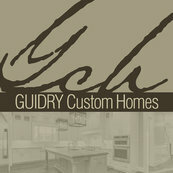 I have worked with Guidry Custom Homes since they built there first new construction home in Luling/Hahnville. They have always been great to work for. Easy to communicate with and always know what they want. Always a pleasure to deal with. I have recommended them plenty of times to friends and family and will continue to. They are great builders and there homes are always beautiful. They also designed a home for a family member of mine and they loved the design and listened to all his ideas. We have been in our Guidry Custom Home now for nearly two years. We love our home and are very happy with our construction team. Guidry Construction was very knowledgeable and experienced. GC's attitude was very relaxed which put us at ease with this being our first new construction.